Is Nepal losing the traditional wisdom of Tibetan healing? What kind of challenges do doctors practicing Tibetan medicine face? How will Nepal help preserve this ancient method of healing? These were among the questions discussed during an international symposium on healing practices in the Himalaya in Marpha recently. Healers practicing Tibetan medicine, called amchi, came from Upper Mustang, Tsum, Kothang and Kathmandu with international experts and travelled to this scenic village in Mustang earlier this month for a three-day conclave. In former times every village in Upper Mustang had its own amchi. Today one doctor is responsible for several villages. It has become more and more difficult for them to pass this wisdom on to the next generation,” said Nyima Samphel an amchi from Jharkot in whose family the practice has been passed down for nine generations through Buddhist and Bon Po rituals. He says the reasons for Tibetan medicine losing its appeal are out-migration, competition from western medicine, and a payment system that is based on voluntary donations. Sowa Rigpa is Tibetan for the ‘science of healing’ and is still practiced in Tibet and throughout the Himalaya, originating from a mixture of traditional Chinese medicine and Ayurveda by exploring the interconnectedness of the mind, body and soul of a patient. Delusion, attachment and aversion, referred to as the three poisons in Buddhist philosophy, can have a harmful effect on one’s health. Tibetan medicine assumes that an imbalance of three humours (wind, bile and phlegm) has an effect on the disease pattern, too. Medicinal herbs, minerals and natural products from the Himalaya form the basis for medical products and alternative, curative treatment. In Tibetan medicine the diagnosis is mainly established by measuring the patient´s pulse, the analysis of the patient’s urine, and an examination of the tongue and eyes. Medical herbs are prescribed to cure diseases and activate self-healing forces. External therapies include bloodletting, moxibustion, compresses, oil massage and herbal baths. Ani Kunsang, a female amchi from Tsum Valley explained: "The combination of several herbal ingredients with the qualitative value of the elements, water and fire, has the same therapeutic value as a bath in a natural, hot spring. In Tsum Valley medicinal herbs are identified and gathered up to an altitude of 5,000m. They are used for the manufacture of drugs and herbal pills." The Marpha symposium was also attended by German Ambassador to Nepal, Matthias Meyer, UNESCO representative Christian Manhart, and Christoph Cüppers who is a Professor of Tibetan Studies. 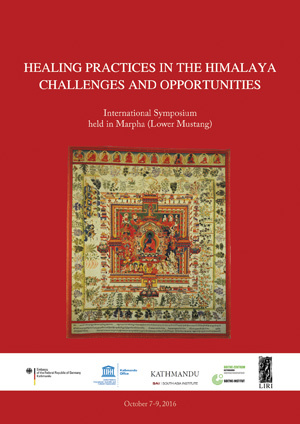 “We intentionally selected Marpha as the venue because the region has a long-standing history of Tibetan medicine, and we wanted to decentralise away from Kathmandu where most programs are held,” explained Nadine Plachta of the Kathmandu Office of Heidelberg University´s South Asia Institut. 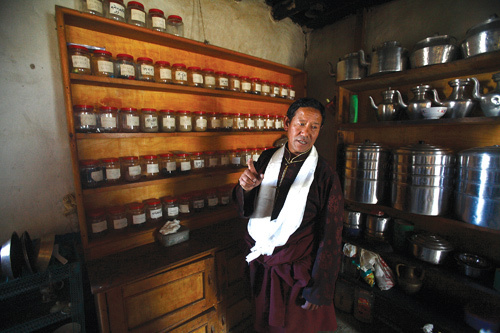 Gaurav Lamichhane, a graduate student of the University of Heidelberg, said one of the reasons traditional Tibetan medicine did not have a wider reach was the lack of recognition by the government of Nepal. The state’s health policy is influenced by western medicine, and natural healing methods are ignored and not appreciated. But Nepal has made progress in the preservation of Tibetan medicine. In 1993 the brothers and practicing amchi doctors, Gyatso (pictured above) and Tenzin Bista, founded the Lo Kunphen Amchi clinic in Lo Manthang and seven years later they opened Lo Kunphen Mentsikhang, a school and training centre for amchis. The Bista brothers are founding members of the Himalayan Amchi Association which is active in the cultivation and sustainable use of medicinal herbs in the Himalayas and the improvement of medical standards. Since September 2016 a Bachelor course in Sowa Rigpa Amchi medicine has been offered by the Lumbini Buddhist University in collaboration with the Sowa Ripga International College Kathmandu. The valleys middle class is increasingly shopping in supermarkets instead of the neighbourhood pasal. "Unless politics is taken out of garbage, and garbage is taken out of politics Kathmandu's waste problem will never be solved."